If you think your vaping habit is harmless, think again. The tobacco industry has been forced to fess up about the dangers of smoking by slapping grisly warnings on cigarette packs, but it hasn’t yet been cornered into giving such disclaimers on e-cigarettes and other vaping products. According to the Centers for Disease Control (CDC), American youth are now more likely to use e-cigarettes than any other form of tobacco. In 2016, more than two million middle and high school students used e-cigarettes each month. Nicotine has known damaging effects: It’s addictive, toxic to developing fetuses and can harm brain development in children and young adults up to the age of 20. The substance that e-cigarette users breathe in and exhale can contain harmful and potentially harmful substances like nicotine, chemicals and heavy metals. Because these products aren’t regulated, it’s impossible to know what’s in an e-cigarette. A recent study, conducted by UNC School of Medicine and published in the American Thoracic Society’s American Journal of Respiratory and Critical Care Medicine, found that not only do e-cigarettes trigger the same immune responses that normal cigarettes do; they spur unique immune responses, too. It comes down to how our bodies process foreign substances. Dr. Pushan Jani, a pulmonologist at Memorial Hermann-Texas Medical Center and UTHealth, explains that when our lungs sense something not quite right is going on, our immune system rushes in to attack. “Common sense would tell you [that vaping] leads to inflammation within the lung,” says Dr. Cedric “Jamie“ Rutland, a pulmonary and critical care physician and assistant clinical professor at University of California at Riverside School of Medicine. This reaction can happen “even if you’re smoking just pure water vapor with no nicotine,” says Jani. 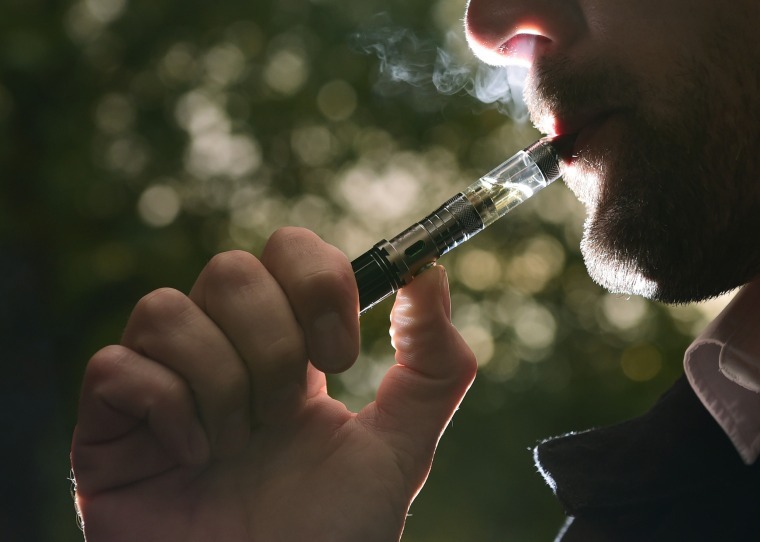 It doesn’t happen very often, but e-cigarette batteries have malfunctioned, causing burns on hands and face and other bodily injuries, some as recently as last year. Also, children and adults have been poisoned by swallowing, breathing or absorbing e-cigarette liquid through their skin or eyes, according to the CDC. But unknown health risks aren’t the only reason Dr. Jackler takes issue with the flavoring of e-cigarettes, he’s also troubled because he understands that part of the tobacco industry’s purpose in advertising fun flavors is to draw in young people. If you’re tempted to make the switch from regular cigarettes, know this: e-cigarettes are not currently approved by the FDA as a smoking cessation tool and studies have had inconsistent results. Experts recommend nicotine replacement therapy like patches, gum, lozenges and inhalers that deliver a small, controlled amount of nicotine to help satisfy cravings and reduce the urge to smoke. But as the CDC says, if you haven’t started smoking or vaping, don’t start now.